In private conversations with friends and on different social media platforms I have defended your right to have a thin body. I have told people that I think you look great, but that also my opinion is pointless. As any sensible person would point out - your body is yours and therefore no one else's business. 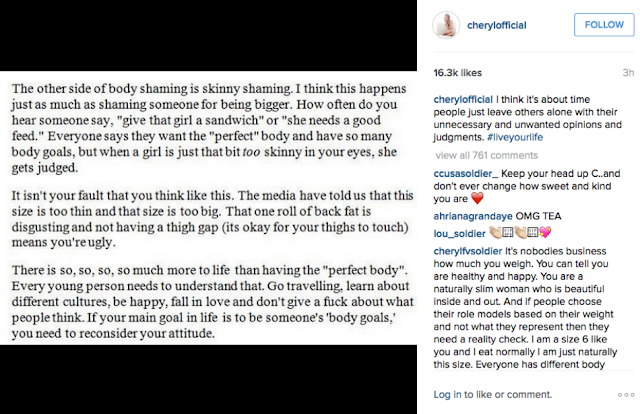 I was so happy when you spoke out about 'skinny shaming' but also reiterated that bullying people with larger bodies was wrong. Your Instagram quote was fantastic, I loved the wording and I knew it was something that your fans would be able to relate to. I liked how you reassured people that thigh gaps are not essential and that back fat is not disgusting. I liked that you told us the media makes us think like that. Imagine my disappointment today when you spoke up about the obesity crisis. I was surprised that someone so against body shaming would speak out about such a complex and sensitive topic, but you did so I decided to read what you had to say. 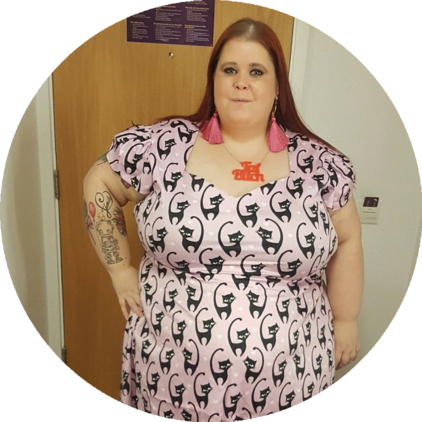 “And being overweight is unhealthy – it’s actually a bad message to tell someone who is obese that they look ‘curvy’ or ‘great’." 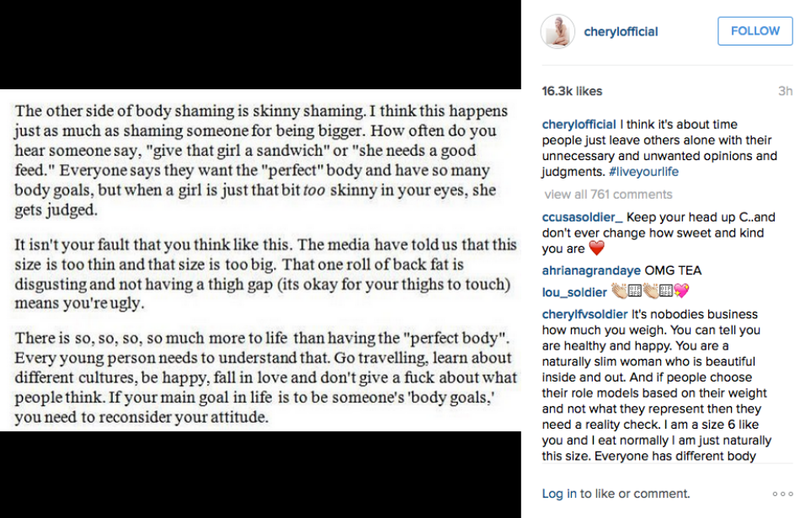 Let me repeat that - "it’s actually a bad message to tell someone who is obese that they look ‘curvy’ or ‘great’." It's a bad message to tell me I look great... Why is it so bad for me to like my body? When did you take such an about turn to go from the media telling us our bodies are bad for you to back them up? 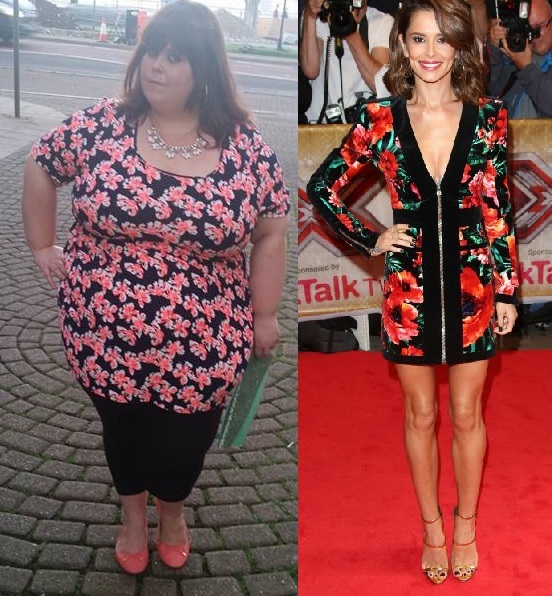 We both have bodies the media want to slate, can't we stand together and tell each other we all look great? I am so sad that you would come out with a message like this, so soon after telling the world that there is so much more to life than worrying about our bodies, why did you change your mind? ?